This month we did two books. It turned out to be a really great decision. 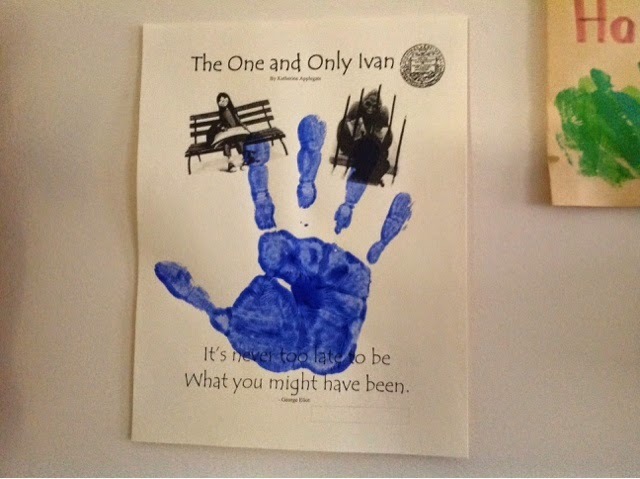 The overall consensus was that Ivan was a more difficult book then Mr. Popper's Penguins. I think the decisions about difficulty are mostly based on the number of pages a book has. Fair enough. It was a smaller group again - about 20 students. We had a great discussion about the ethics of keeping animals in captivity, about how animals warm our hearts, and how to change your life when you know you need a change. They were amazed that there really was a real Ivan. We read his eulogy and watched a video of the real Ivan. We also did a craft. I am starting to realize that a craft is a highly favoured activity. This craft was a repeat of the last time we did this book. We made hand prints. I had blue and red paint. Maybe I should have just had red since that was Ivan's favorite color. Take away: I need to remember to take pictures during book club! !